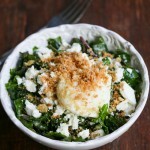 This Kale Salad with Feta, Garlic Panko Crumbs and Fried Slow Poached Egg is seriously addicting. 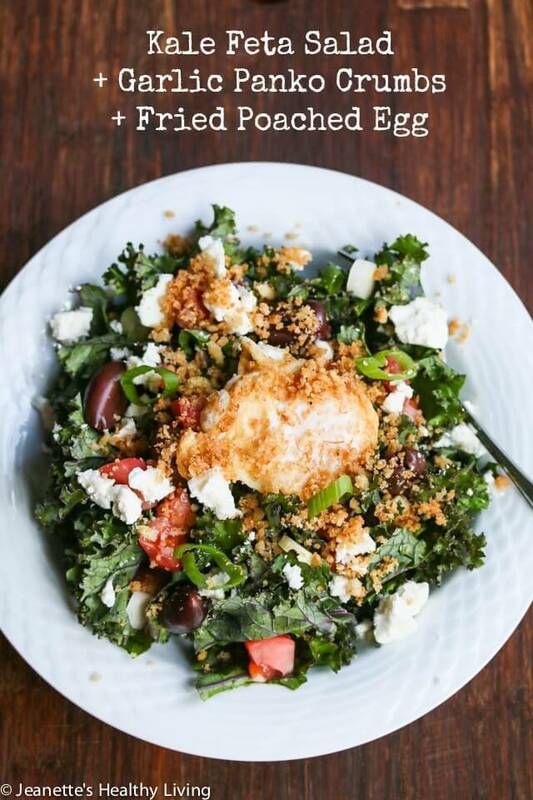 Recently, I clicked on a link for Mei Mei’s food truck in Boston and discovered their Amazing Kale Salad menu item. 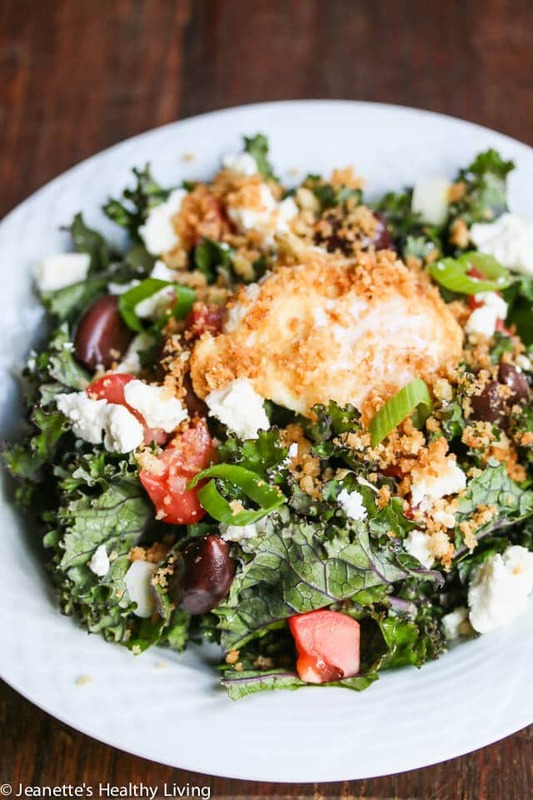 I don’t even know how I ended up on their site, but that kale salad description intrigued me – their kale salad is topped with not only a slow poached egg that’s then fried, but it’s served with crunchy garlic panko crumbs and feta cheese. I invested in a circulator earlier this year so I could experiment with a cooking technique called sous vide. Although I’ve tried making fish, vegetables, and some meats using this method, I’ve found myself making batch after batch of sous vide poached eggs. The boys have been going through dozens of eggs this summer, eating 2-3 eggs at a time with their Refried Bean Breakfast Bowl. So, although I’ve never eaten off the Mei Mei food truck, I tried to recreate what I thought this salad might be like, with a few twists of my own. Since tomatoes are in season, I added some fresh chopped tomatoes as well as some red onions. Another time, I used scallions in place of onions, and also added kalamata olives. Since I had a batch of sous vide poached eggs in my refrigerator, it was easy for me to make the fried slow poached egg. I know most people don’t own a circulator, so if you want to try this salad with an egg on top, just use a regular poached or fried egg. 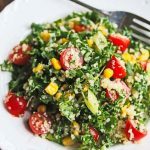 This kale salad is seriously addicting in a good way. I’ve made it at least 4-5 times in the past few weeks. The garlic panko crumbs are key, adding a nice crunchy texture. You can serve this salad to a crowd and leave off the fried slow-poached egg (that’s what I did when I made this for our family). When served with a poached egg, it makes a great meatless meal – I could eat this at least several times a week. After making this salad, I found a video of one of the owners of Mei Mei making their kale salad. 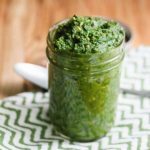 Apparently, they massage the kale (lacinato is their favorite – I used a red tinged curly kale from our farmer’s market) with the dressing to soften it before topping it with other ingredients. 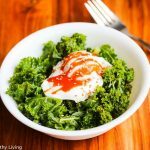 Just for kicks, I made this kale salad based on their technique and ingredients (no tomato or onion). The texture of the kale is definitely silkier, so if that’s what you prefer, by all means massage your kale. I actually preferred the un-massaged kale version. Let me know which version you like. Place kale in a large salad bowl. Whisk together Salad Dressing. To make Garlic Panko Crumbs, heat olive oil in a small skillet over medium heat. Add garlic and panko crumbs; saute until light brown. Season with salt and fresh ground pepper. Set aside. 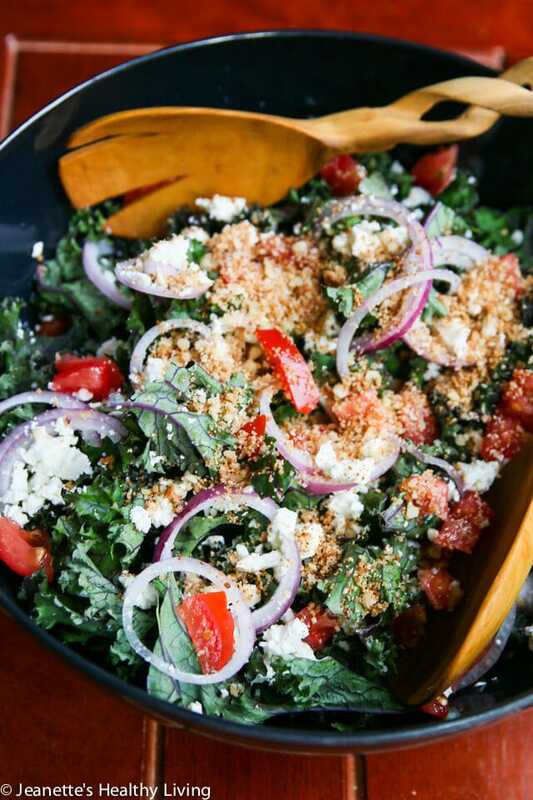 Top kale with chopped tomato, onion, and feta cheese. Sprinkle with Garlic Panko Crumbs. Drizzle with some of the Salad Dressing and toss lightly. Season with fresh ground black pepper. Divide kale among 4 bowls. Top each bowl with some chopped tomato, onion, feta cheese and olives. Carefully place a fried slow-poached egg on top of each bowl. Sprinkle with Garlic Panko Crumbs. Serve dressing on the side, along with a pepper grinder. 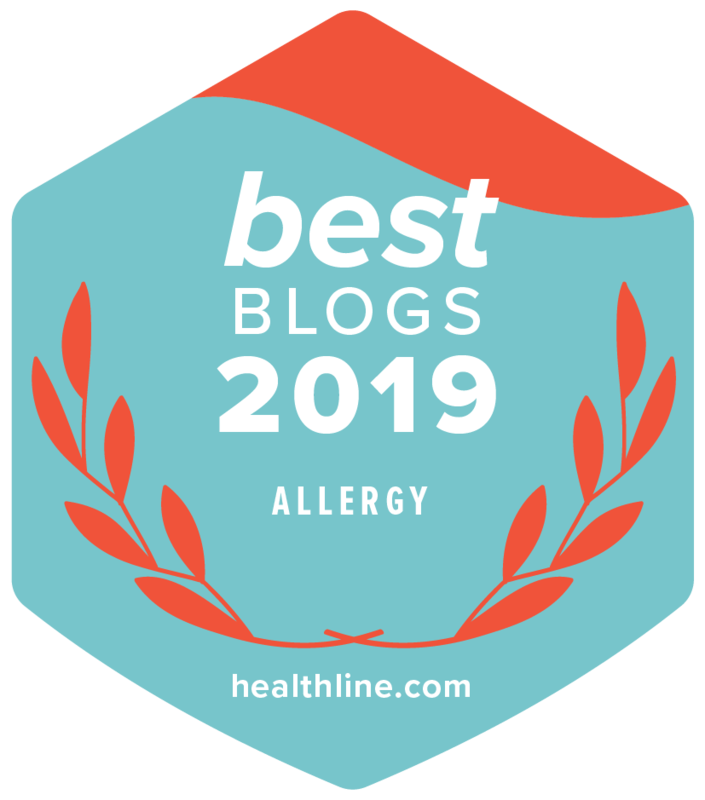 I love kale, massaged or not…my husband said that kale is my winter ice cream. 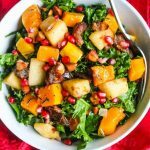 This salad looks filling, delicious and GOOD for you! Winter ice cream – that’s so funny Angie! I forget where I was recently where I had a fried poached egg…but it was revelatory. Definitely a perfect salad topper! 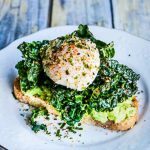 The fried poached egg is definitely a special topping for this salad – I’m loving sous vide for poaching eggs. A fried poached egg! Mind. Blown. I just learned to poach properly (and even now, it’s hit or miss!) so I am intrigued! 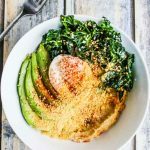 I love the idea of panko topping. What a terrific way to add texture to this dish. The garlic panko crumbs are really good – I think they’d be good on almost any salad. Like mini crunchy croutons. It’s rare I get a eat a salad since my boys are too young to really appreciate them (I cook so much, I’m not going to cook separate for me too). I know I would love this and probably eat the entire bowl myself. Looks amazing! Laura, I keep washed kale in my fridge and make extra garlic bread crumbs and dressing. That way, it’s easy for me to make this for myself at dinnertime. 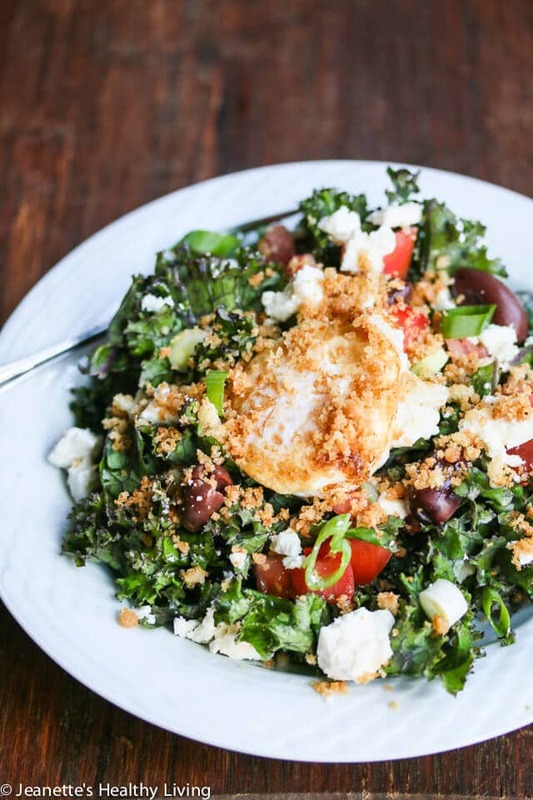 All you need to do is crumble some feta cheese (or you can buy crumbled feta). 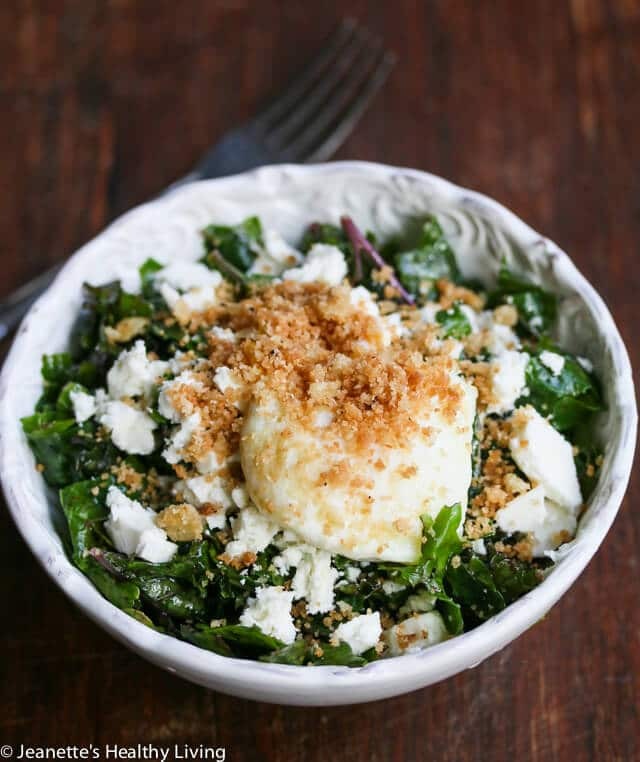 I love kale either way but with that panko topping and poached egg this salad sounds amazing! 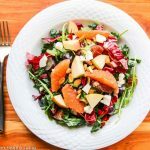 Kelly – I think you would really enjoy this – lots of textures going on in this salad. I love garlic panko! 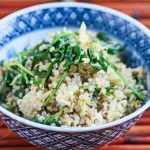 I use to tope everything with panko garlic 😉 This recipe looks so healthy but at the same time so yummy! Pinned! Olivia, I think I could sprinkle those garlic panko crumbs on just about anything too! Ooh I want this for dinner! Delicious! Thanks Russell – this is so good, I can eat it practically every night! What a delicious recipe Jeanette! Kale is being picked by the pound right now in the garden so this came at a perfect time! Thanks Pamela – I love your garden – wish I had kale growing in my backyard. I made your salad tonight and I must tell you that it was the BEST kale salad I have ever tasted! 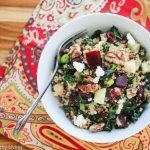 Tracy – so glad you enjoyed this kale salad recipe. I’ve made this so many times and still don’t get tired of it. Will definitely make this soon… Costco in my area is selling a 1.5 lb bag of pre-washed baby kale under the Taylor Farms Organic label. Only downside is they have 3-4″ long wiry stems so I throw it in the food processor & pulse a few times. Makes those stems more palatable without having to stand there & cut them off. This recipe sounds terrific & with my new-found skill at microwave poached eggs, it’s sure to be a big hit! Karen – hope you enjoy this salad as much as I do. It is unfortunate that packaged kale doesn’t have the stems removed. I’ve had the same problem with frozen kale. 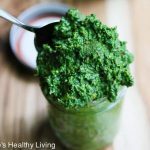 I find it easier to just buy kale by the bunch and strip the leaves off the stems, but I like your idea of whizzing them in the food processor to break them down a bit. Yes, those stems are awful, especially on the full grown kale. The stems are inedible (to me) and they add a lot of useless weight to the pkgs! The baby kale at Costco is nice, the stems are very skinny but very wiry. The quick chop works but last night I actually stood there & pinched them off before adding the leaves to a salad… Thanks again for the recipe!